Last year, we made haggis sausage rolls as a starter before the traditional Burn’s Night meal of haggis, neeps and tatties. We remembered them fondly so, this year, decided to cook just the sausauge rolls. What we both particularly liked about the sausage rolls was the outside edge where the meat meets the pastry and the fat combines. So, we changed our minds and decided to make a tart, reasoning that there would be more of those sticky, crispy edges. This didn’t quite work out but it still made for good eating. In order to thoroughly test the theory of those edges, we made a sausage roll too. We both actually preferred this and really should have stuck to that in the first place. The traditional whisky and cream sauce would have worked well with this but, fearing for our arteries, we ate salad instead. 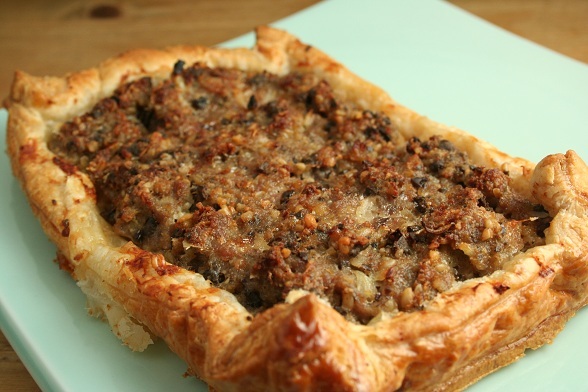 Subscribe to comments with RSS	or TrackBack to 'Haggis Tart'. I love haggis but sadly not having it tonight – my husband loves it too and is away with work so we’re having a ‘belated Burns Night’ next week! 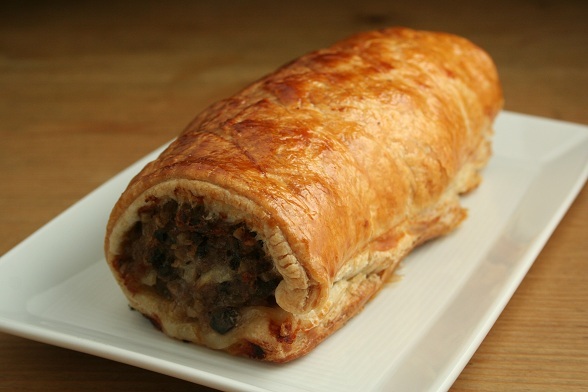 Love the idea of a haggis sausage roll. Yum. I took one look at the haggis roll and my mouth began watering. I told Hubby about it and his immediate reaction was “a) it’d be horrible and b) if it’s a good haggis, why wrap it in pastry?” – and this from the man who will eat anything, so long as it’s wrapped in pastry. I swear, there’s no fathoming the beasts. Thanks, Antonia. Every year, we vow to cook it more but never seem to. We both love it too. Thanks, Becky. Your flatbreads looked great. I can see his point, Jenny. I could eat haggis in any form but it does work particularly well with the pastry. Once, in Scotland , we had haggis in volauvants drizzled with orange sauce. my 16y/o Midwest American step daughter thought it was to die for just as this scottish adult did. This looks to be quite as good. Can’t wait to try. The haggis has to be shipped frozen from Cameron’s Brit foods in Florida but I’m gonna do it!